Good Morning my friends... as I sit here this morning I am again looking at a winter wonderland. I am truly amazed at the weather in our parts lately. It is such a surprise to see all this snow and it is still coming down hard! We try our best to keep sodas and such out of our home, but sometimes water and tea get old and you would a little something else. I plan on using my kombucha bottles, even though in this particular recipe it says don't use glass, I don't understand why you wouldn't. I mean, anything you bottle is going to have some pressure and these bottles are made for beer/kombucha or whatever. I'm also going to try out a 3 citrus marmalade recipe too. I picked up some organic blood oranges, meyer lemons and grapefruit. Doesn't that sound dreamy here in the cold of winter? Mmmm. Are you using the Nourishing Traditions recipe??? Let me know how it goes...I'd like to make it. I made a couple out of NT and found that I needed them to be a little sweeter for my tastes...so I either added stevia or made a simple syrup and added it directly to my glass. Go to this link, it says why they don't suggest using glass for ginger ale. Homemade ginger ale sounds wonderful. We only have tea and water in our house. Occasionally, a group will leave some soda in the fridge after checking out. Then, it is a real treat for us. 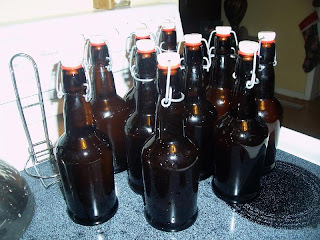 I can't wait to hear how your ginger ale turns out. Maybe I'll make some. Good luck. Tad made root beer once in glass bottles and one night we woke up to glass exploding (thank goodness they were in a closet). We don't recommend using glass for that reason.